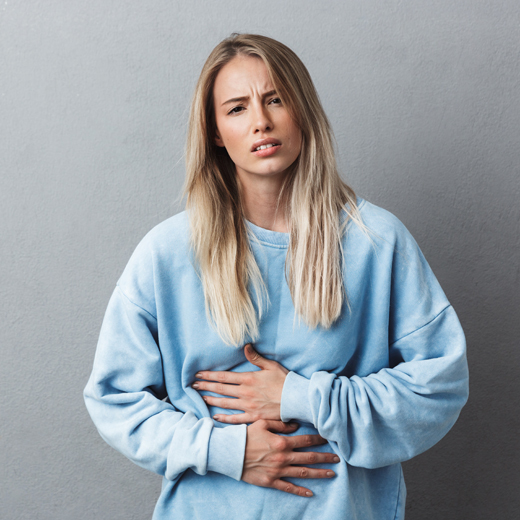 Excessive flatulence, bloating, constipation or diarrhoea, burping, a feeling of heaviness or nausea after meals, lack of appetite for meat or a desire to eat despite having a full stomach, heartburn, reflux, and a sour aftertaste in the mouth are just some of the symptoms of insufficient stomach acid. If you also suffer from allergies, psoriasis, or malabsorption, have observed recurring rashes, are underweight or obese, have brittle nails, hair loss or undigested food in your stool, it most likely means that your stomach is secreting too little stomach acid. There may be several reasons for this phenomenon. One of the most common is the use of antibiotics or antacids, and the use of substances such as alcohol or cigarettes. Of course, what and how we eat is also of great importance. Highly processed, sugary foods and fast foods have a very negative effect on the whole digestive tract. The type of diet and lifestyle are also important. Vegetarian and vegan diets, which have a high consumption of grains, don’t require as much digestive juices to be produced as diets that include meat. Low secretion of hydrochloric acid is also seen in people under a lot of stress, in whom its release is blocked by hormones. The most-important role of the stomach is the initial digestion of protein and fats, as well as sterilisation of food by maintaining an adequately low pH of gastric juices (1.5 to 2.5), which destroys microbes such as bacteria, viruses and parasite eggs. Proper acidification of the stomach is necessary for it to function properly. A lack of stomach acid causes problems with proper digestion of meat, fish, eggs, dairy products and vegetables, in particular legumes and raw vegetables. If not digested, protein stays behind in the stomach and ferments – hence the feeling of being overly full, bloated or gassy. Decreased stomach acidity doesn’t allow you to completely digest food, which then remains and rots in the gastrointestinal tract, negatively affecting the whole body. It results in inflammation, which damages the mucosa and intestinal villi leading to leaky gut. In addition, when the pH of gastric juices is too high, the production of pepsin, which is the enzyme responsible for the initial digestion of protein, is impaired. Undigested proteins are dangerous if you have a leaky gut, causing and intensifying various allergies and autoimmune diseases. At a pH above 5, bacteria such as helicobacter pylori start multiplying in the stomach; these bacteria are associated with the formation of gastric and duodenal ulcers. Insufficient hydrochloric acid results in hindered fat absorption, which in turn translates into problems with the absorption of vitamins and minerals, leading to serious deficiencies. Fatty acids are necessary for the absorption of beta-carotene and vitamins A, D, E and K from meals. Stomach acid levels also affect how well carbohydrates are digested. They’re broken down in the presence of pancreatic enzymes, the secretion of which depends on the adequate acidification of food entering the intestines. A lack of pancreatic enzymes results in the excessive production of gases, which can lead to reflux. People with reduced gastric acidity are typically deficient in zinc, which is an element necessary for the production of hydrochloric acid; zinc also influences the proper functioning of the immune system and the thyroid, and plays a role in the condition of hair, skin and nails. Impaired protein digestion in an insufficiently acidified stomach also significantly reduces iron absorption. That’s why if you have been diagnosed with anaemia, you should always check your stomach acid levels. Perhaps it’s low stomach acid levels that are the reason for your anaemia caused by a lack of iron, which is necessary for the proper metabolism of B vitamins, in particular B6 and B12. Hydrochloric acid itself is essential for the absorption of vitamin B12, which ensures the proper functioning of the nervous system, circulatory system and brain. Deficiency in vitamin B12, B6 or folic acid causes an increase in the level of homocysteine, which is a factor in the development of atherosclerosis. Unfortunately, often symptoms of hypoacidity are confused with those of hyperacidity, for which antacids are recommended. These drugs result in a complete shutdown of the stomach’s digestive functions, even for up to 24 hours, which causes problems with calcium absorption and significantly increases the risk of osteoporosis. To check if hypoacidity is a problem for you, you should first find out the levels of elements in your body. One of the methods used to test this is elemental hair analysis. 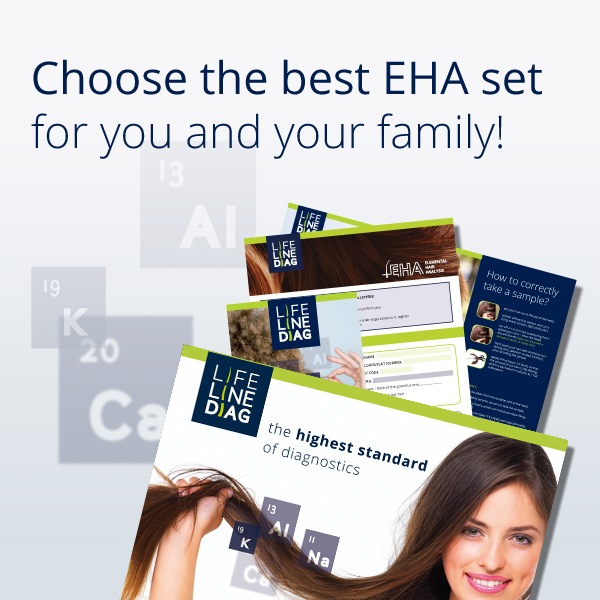 The test results will show which elements you’re lacking, and which ones are at adequate or excessive levels. The key elements that’ll give you this information are those that are known to be poorly absorbed when there is low stomach acidity (e.g. calcium, zinc and iron). You can also carry out a test using baking soda – dissolve one teaspoon of baking soda in 3/4 glass of water and drink it. It’s important that the test is carried out on an empty stomach, first thing in the morning. Hydrochloric acid in the stomach will react with the sodium bicarbonate and immediately produce carbon dioxide, which will make you burp. The conclusion: the longer you have to wait for the burp, the less hydrochloric acid you have in your stomach. Vitamin C preferably natural, taken during meals. It releases and promotes the absorption of iron, which helps to acidify the stomach. Apple cider vinegar only good-quality, organic ACV, preferably homemade. How to use: 1 2 tablespoons of apple cider vinegar in 1/2 cup of water (children: 1 teaspoon in 1/2 cup of water), drink 3x a day 15 minutes before meals. Several weeks of this treatment will help stabilise the functions of the stomach. Do not use spirit vinegar for this – it’s harmful to the stomach and kidneys! Lemon juice can be used instead of apple cider vinegar. How to use: drink 1/2 a cup of undiluted lemon juice 3x a day before meals. Table or rock salt unrefined, non-iodised salt, such as Kłodawska or Himalayan salt. How to use: eat a pinch of salt, especially before or after a large meal, several times a day. You can also drink it dissolved in water. Stomach drops their bitter taste provokes the secretion of hydrochloric acid in the stomach. Spices and herbs stimulating the production of gastric juices and improving the functions of the entire digestive system include peppermint, ginger, cloves, fenugreek, aniseed, basil, savory, caraway, coriander and nigela sativa. Wormwood – how to use: drink wormwood mixed with water every morning for 10 days. Don’t use it in children or long-term, as it negatively affects vision. Hydrochloric acid with betaine (betaine hydrochloride, betaine HCL) and pepsin – capsules should be taken immediately after you begin eating. If you take too much betaine, you may feel warmth in your stomach. If this occurs, reduce the dose. Betaine supplementation should always be consulted with a doctor due to possible contraindications. To start with, you should exclude foods that require large amounts of gastric juices to digest. These include fatty, fried, and rich foods containing large amounts of animal protein. Light meats such as veal, poultry and fish are recommended. Your food should be poached or braised, finely chopped, preferably in a paste or liquid form. This will make your stomach’s work easier. You should also remember to avoid sugar, as it strongly inhibits the secretion of digestive juices. The second-most-important thing is the way you eat. You should thoroughly chew each bite for a long time. Meals should be eaten regularly, and you shouldn’t overeat. Your portions should be small but eaten often – preferably five times a day. To avoid diluting your gastric juices, drink between meals and avoid drinking during, just before and immediately after meals. Remember that the stomach likes sour, salty and bitter flavours. Adequate stomach acidification is one of the key factors directly affecting your health. Checking the acidity of the stomach can help eliminate many diseases and their bothersome symptoms. Justyna Brzezińska, Obniżona kwasowość żołądka: przyczyną anemii, otyłości a nawet alergii i chorób autoimmunologicznych (Decreased stomach acidity: a cause of anaemia, obesity and even allergies and autoimmune diseases), DietPoint, 1(2)/2019, pp. 4-8.